There isn’t a day that goes by that I don’t hear a question about nutrition that makes me wonder…when did nutrition get so hard? We are putting butter in coffee, using pH strips to test our urine, meticulously combining foods, diligently tracking food and exercises, and spending lots of money on new diet books, color coded food containers and supplements. It seems like we are getting stuck, fixated and obsessed with small details that are really just distractions (I should know, I’ve been there). In those questions, and from my experience, I sense so much distrust with food and our own ability to feed ourselves. I think it’s so important to understand that trusting yourself with food is innate. We don’t start out distrustful, we learn it. This could be due to parents overstepping their boundaries, dieting history, traumatic events around food or doing too much “research” on google. Your problem isn’t that you can’t trust yourself, it’s that you don’t believe you can. It’s really helpful to identify what is working and what isn’t working. I notice so many people are afraid to admit that something might be working, and typically need reassurance they are doing it right. Even something like “I’ve been eating banana and peanut butter for a snack…is that OK?” I typically follow up with questions like “do you enjoy it?”, “does it keep you full, satisfied and energized until your next meal (or snack)?”, “do you feel like you have enough variety at meal and snack times?”, etc. If they answer yes to these questions, then it’s working. If they say no, then they answer their own question. In the past, you may have determined if something is working based solely on how perfectly you followed the rules and how it effected your weight. Your relationships could be falling apart, your energy levels could be at an all time low, you could be losing hair, not sleeping well or feeling very emotionally and physically deprived…but if you’ve been perfect with the rules and you’re losing weight, it’s working. On the other hand, you could have thriving relationships, a ton of energy, great sleep and feel very content…except following food rules feels obsessive and your weight hasn’t budged so it’s not working. How does that make any sense!? 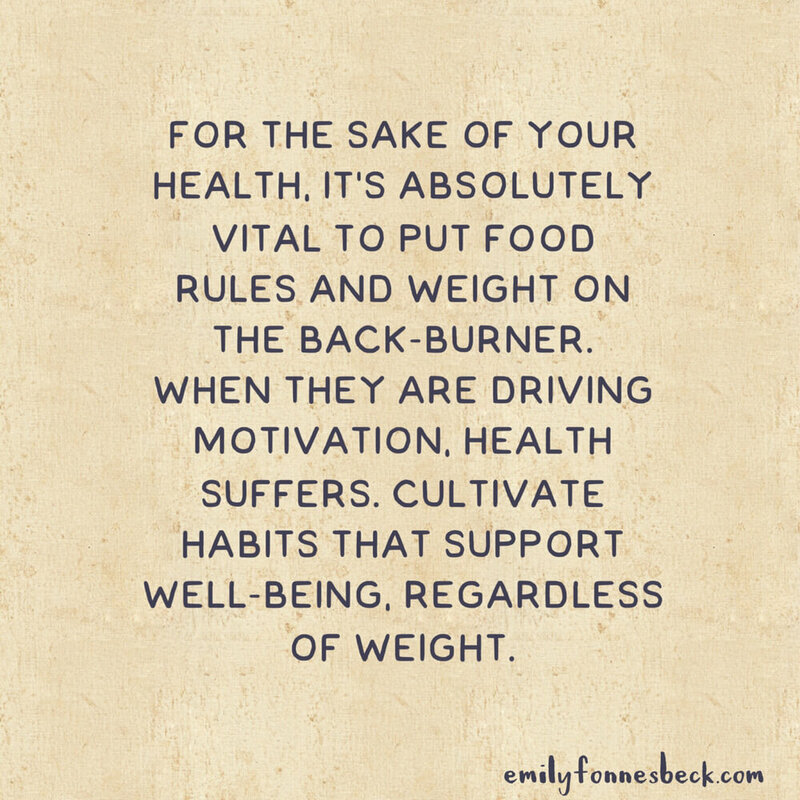 This is why for the sake of your health, it’s absolutely vital, in my opinion, to put food rules and weight on the back burner. When it’s the driving motivation, health (in body and mind) suffers. On the other hand, I once again encourage you to cultivate habits that support your well-being, regardless of weight and body shape, while learning how to trust your own experiences with food. We learn best by our own experience. I can tell you that eating without restriction and deprivation while trusting your intuitive signals of hunger and fullness will lead you to naturally moderate your choices that support your own well-being. But until you experience it, it will be hard to believe. While you might assume that having someone tell you how and what to eat will help, it actually only hurts. It pulls you further and further away from living and experiencing…the very things we are here to do. Isn’t it sad that so many of us are afraid of admitting something is working? We have this never ending sense of impending doom, of waiting for the other shoe to drop, for someone to tell us we are doing it wrong or for all the positive changes we have seen to be taken from us. If that’s you, meet that fear with gratitude. Allow yourself to feel encouraged by the progress you are seeing. TRUST your experience. Have faith that you will figure it out, by continuing to listen and learn from your own body and mind. Can I offer a suggestion as you do so? Keep it really simple! Right now, pull out a piece of paper. On one side, list what’s working. On the other side, lists what’s not working. What things are bringing you greater peace? What things are causing a disconnection from yourself and others? What things are helping you feel better physically? What things are keeping you trapped in the diet cycle? What things are building more trust with food? What things are still causing you food anxiety? Remember, this has nothing to do with weight…it’s all about the changes you are seeing in how you think and behave around food. One last word, a very wise man once told me “what you fear you create.” If you find yourself with disordered eating, body image issues and food anxiety, I think you’ll find that just the act of putting food rules and weight concerns on the back-burner opens up the possibility for health to be something you can feel NOW rather than some number or goal you are hoping to reach. I think you’ll find that worrying about food and weight creates the problem. But again, you won’t know until you experience it.